"Romance in the midst of war!" 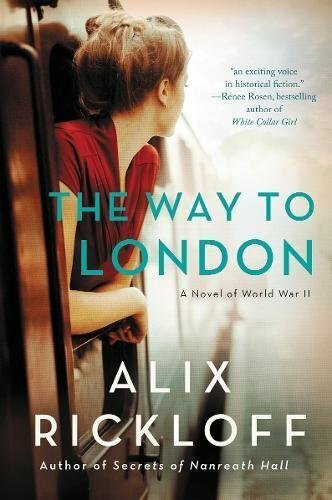 THE WAY TO LONDON is a WWII fiction set in England and provides a fresh or somewhat lighter read than many WWII novels I have read. Rickloff has written a book that is easy to fall in love with. The characters are refreshing and real making them easy to relate to or even love. I found Lucy to be charming with a little sass which makes for a daring character that is not afraid to face her fears. She is deeply emotional which she tries hard to hide. Bill is rough around the edges and in need of structure. He has a good heart which readers will fall in love with. There are many characters that take a little time to reveal their true nature or personality but meshes with the story and works lovely. The romance in THE WAY TO LONDON is unlike any other and develops beautifully. There is a playfulness in the chemistry between the two. I like the give and take they share in order to make things work for them. I did find this to be a fast read but one that you can easily get lost in. This book is more of the romantic side of war and not the bloody battle scenes. There is a lot of depth and history between the characters that makes for an overall amazing read that will not be forgotten easily. I recommend THE WAY TO LONDON for anyone who loves a great historical romance novel that is more focused on romance than war. From the author of Secrets of Nanreath Hall comes this gripping, beautifully written historical fiction novel set during World War II�the unforgettable story of a young woman who must leave Singapore and forge a new life in England.